Note: If you don’t know what sacred geometry is, or not familiar with the “new age” Movement, this probably won’t make much sense. so read on and run the risk of being terribly confused! And you might be wondering why it actually matters. So, Anyway, after reading a few articles over the years, such as this one: Metatronic Distortion, Why I am no longer a lightworker, and a few articles on the gnostic notion of “Archons” and the demiurge. That one goes into a bit of detail on what the subject matter is actually about. And last but not least:t David messanic’s Book The Flower of life. Gosh, that was a tedious read. I think there is a second one as well. But honestly, alot of it didn’t make any sense to me. and just looking at the supposedly sacred flower of life makes me feel a little off. It just feels wrong somehow. Yeah, pity me for spending Hours upon hours actually doing the research, as opposed to believing whatever some modern guru says. It was worth it. This one has an extra point in it. Funnily enough, It’s knowledge. Just a general rule of thumb: good entities will never test you, tell you that they will save you (even if they did save us, you wouldn’t want it), or tell you that the knowledge that you have gained must be shared . (I would link the exact page, but I only borrowed the book from somone)Because that Is the quite possibly the biggest give-away right there. Any wise person knows that is a terrible idea. The Tree of life overlayed onto the flower of life. Notice how there is a point missing. It’s important. Most people will distort and misunderstand the teachings. (which they have) Of course, the entities that spread this teaching want to do so because that allows them to harvest the energy of the people using it. Anyway, I want to discuss the specifics of the geometry now. Like I said, Most of this stuff people think they are not clever enough to understand it. I personally think when most people can’t understand something it is because it is nonsense. And the Trinity in that book practically only gets one page devoted to it. which is also very telling. Psst, I put a linky on here! It certainly does look that way. But why on earth would anyone want to do that? Never mind how. Honestly, I’m sick of this whole scene. It makes me sick. The level of perversion of the ancient sciences is astounding. Admittedly, this is “Atlantean death science”. what do you expect? Gosh, It gets very tiring discovering all of these things. and I get progressively further and further away from normality. There isn’t really that much I can say that hasn’t already been said in most of the links I’ve added. But there is one more thing I’d like to say. As I mentioned earlier, this “Metatronic” Tree of life is lacking the point in the middle. 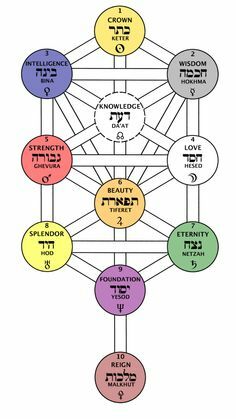 And one can essencially compare the tree of life to the chakra system. A more expensive one at that. And taking that point away traps you here. Well, I don’t really know what else to say. Well, thanks for reading. If you want to see some new Sacred Geometry I have made, Click Here.